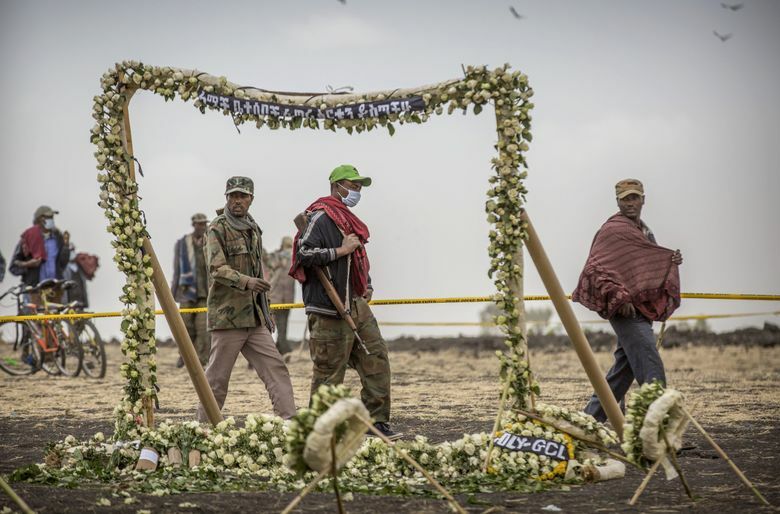 Investigators on the ground near the crash site of the Ethiopian Airlines 737 MAX found the plane’s jackscrew, a part that moves the horizontal tail of the aircraft, and it indicates that the tail was in an unusual position, according to an aviation safety consultant briefed on the findings. The consultant, John Cox, chief executive of Safety Operating Systems and formerly the top safety official for the Air Line Pilots Association, said that Boeing’s new flight control system on the MAX — implicated in the preliminary investigation into the earlier crash of a Lion Air jet in Indonesia — is one of several possible systems that could explain the unusual deflection in the horizontal tail, a control surface that swivels to pitch the plane’s nose up or down. This, along with evidence from a new satellite-based system that tracked the flight data and revealed similar trajectories on the two flights, is what finally led the Federal Aviation Administration (FAA) to ground the MAX on Wednesday, following regulators around the world. Boeing, meanwhile, plans to continue production and keep its 737 supply chain and assembly lines moving, even as investigators continue to look into the causes of both crashes that together killed 350 people and led governments across the globe to ground the aircraft. “There has been no change in the production rate at this time,” Boeing said in a statement. The FAA briefed lawmakers on Thursday about Boeing’s plans to develop a software patch for the suspect flight control system, providing the most detailed look yet at the company’s efforts to get the plane back in the air. The timeline for that fix — which would still have to win FAA approval — means the planes are unlikely to be cleared to fly any earlier than toward the end of next month. In an interview Thursday, Rep. Rick Larsen, D-Everett, chair of the House Aviation Subcommittee, said the FAA expects to approve a software fix for the new flight control system — called MCAS (Maneuvering Characteristics Augmentation System) — by the end of this month so that Boeing can begin to deploy it in the worldwide fleet of nearly 400 MAXs in April. He said Boeing will also provide more training materials for pilots on the system and on the changes made to how it operates. In a less optimistic analysis, Ronald Epstein, an aviation industry financial analyst with Bank of America, told investors it could take Boeing three to six months to fix the troubled aircraft. The worldwide grounding, meanwhile, has left airlines scrambling to meet their schedules with other planes. 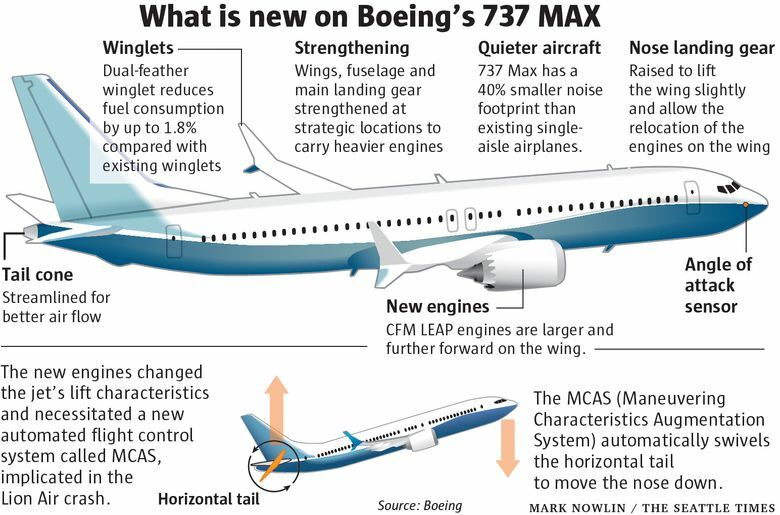 The new flight control system on the MAX, the MCAS, was added so that the new plane would behave and feel the same to pilots as the older model 737s. It was necessary because the new model’s bigger engines, positioned farther forward on the wings, changed the plane’s lift characteristics in a high-speed stall situation. MCAS is designed to swivel the horizontal tail so as to push the plane’s nose down automatically, without pilot input, if a sensor on the fuselage indicates the nose relative to the air flow is at too high an angle — the Angle of Attack (AOA). Boeing has been working on a fix since soon after the Lion Air crash, when a preliminary investigation indicated that a false reading on the AOA sensor triggered MCAS to repeatedly push the plane’s nose down and forced the Lion Air pilots into a losing struggle to pull it up again. The Lion Air jet flew for 12 minutes before crashing, the Ethiopian Airlines jet for six minutes. Full data is publicly available only for the Lion Air flight. Regulators now have similar data for the Ethiopian flight but have not released it. Only the data from the first three minutes of the Ethiopian flight is public. Cox was briefed on the full flight data for the Ethiopian plane. He said that as the plane turned back toward the airport after getting into trouble, its airspeed was way too high for a plane coming in at that altitude and intending to land. 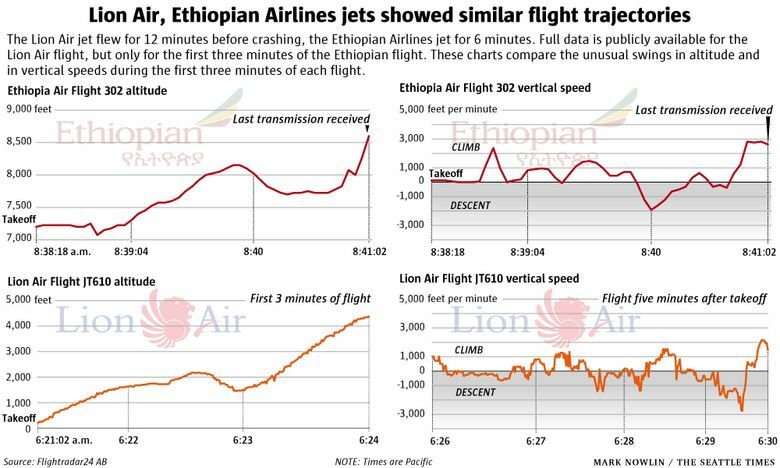 The Ethiopian Airlines jet’s speed was much higher than that of the Lion Air plane that crashed, he said, but otherwise their trajectories were similar, particularly in the erratic variances of vertical speed and unusual swings in altitude. With the MCAS flight control system already implicated in the Lion Air crash, it’s now seen as the potential cause of both. Boeing’s software fix will make a series of changes, according to a summary provided to Larsen and other lawmakers during a private briefing Thursday. The company said it will change the MCAS software to give the system input from more than one AOA sensor. It will limit how much MCAS can move the horizontal tail in response to an erroneous AOA signal. And when activated, the system will kick in only for one cycle, rather than multiple times. Unless some other cause for the crashes emerges, 737 MAXs will remain grounded until that software patch is fully deployed and approved to have fixed the problem. 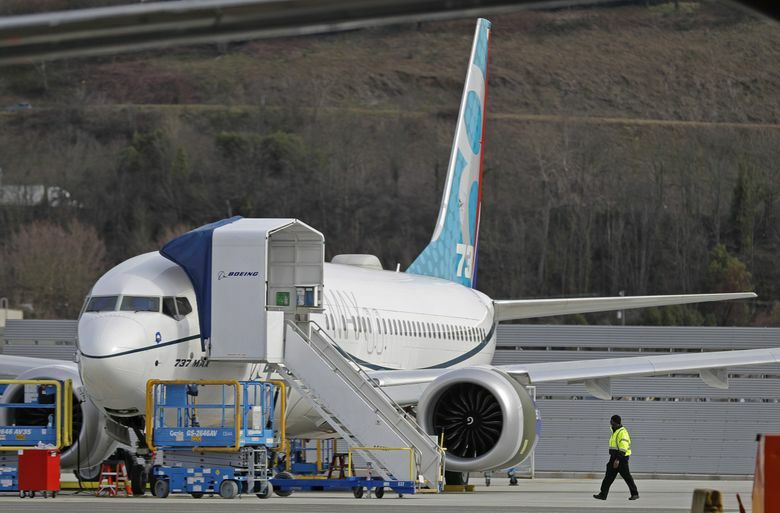 For now, Boeing foresees normal operations at its 737 assembly plant in Renton. In a brief statement Thursday, Boeing said it has paused delivery of MAX airplanes, but will continue to roll out the aircraft at the current rate of around 52 jets a month. The FAA’s emergency grounding order on Wednesday allows airlines or Boeing to fly the aircraft without passengers aboard, to move them for storage, repairs or maintenance. That means Boeing will be able to fly completed MAXs that roll out in Renton on ferry flights to Boeing Field or even to Moses Lake in Eastern Washington for storage as jets stack up with no deliveries possible. That should allow Boeing to maintain production in the near term. A break in deliveries that long would have significant financial implications. Boeing’s cash flow will be drastically reduced as long as the planes are grounded. And it will have to offer compensation to airlines for the losses accrued from parking planes. Ken Herbert, an industry financial analyst with Canaccord Genuity, estimated the immediate fix as a $500 million investment with another $1 billion in cash flow lost monthly. “We then see the potential monthly risk of up to another $1 billion depending on how much of the airline operating revenues Boeing ultimately reimburses,” Herbert told investors. Analysts on Thursday downplayed the impacts of the grounding on Boeing’s airline customers, largely because the 737 MAX still accounts for a relatively small fraction of the global fleet. In the United States, the carrier with the largest 737 MAX fleet is Southwest, but its 34 aircraft “account for less than 5 percent of our daily flights,” the company said Wednesday. The 24 MAXs at American Airlines make up about 3 percent of its single-aisle jet fleet. At United Airlines, the 14 MAXs account for about 2 percent of its single-aisle jet fleet. Dennis Tajer, a spokesman for the Allied Pilots Association at American Airlines, said some flights were canceled Thursday, inconveniencing passengers, but he expects American will recover its schedule quickly by substituting planes. “It’s disruptive, but manageable,” he said. However, some airlines will take a greater hit. European low cost carrier Norwegian, for example, has taken delivery of 18 MAXs specifically to fly new long-haul routes, in particular transatlantic routes. On Wednesday, the airline said it will temporarily replace its 737 MAX 8 on its route between Dublin, Ireland, and Stewart Airport north of New York City, with a Boeing 787-9 Dreamliner. The MAX 8 seats 189 passengers while the Dreamliner seats 338. That airplane is clearly much too large for this small route and will have to fly with a lot of empty seats, likely losing money on every flight. Boeing is so strong financially that it can likely absorb the costs of even a months-long grounding with little long-term impact. What’s more concerning is the reputational damage. The MAX has a backlog of nearly 4,700 orders and it’s the jetmaker’s cash cow. To come through this trauma successfully, Boeing needs to put this new 737 safety problem firmly behind it, as it did with a comprehensive engineering solution to the overheated battery problem that arose in 2013 on the 787 Dreamliner. Boeing must also brace for a barrage of legal actions. These will include lawsuits from carriers claiming financial damage from the grounding, but also lawsuits from families of the victims of the two crashes. And the FAA will not be unscathed. It’s already enduring criticism about its lack of oversight. In contrast, Larsen said that while other countries were ahead of the FAA in banning the MAX, they are now awaiting FAA guidance on the planes. “The world is actually looking at the FAA to determine when these planes will fly again,” Larsen said.